This 6" lift kit is based around two one-piece, 1/4" laser cut high clearance crossmembers and replacement steering knuckles. The high clearance crossmembers increase ground clearance for off road performance. The replacement steering knuckles reduce installation time as well as maintain proper steering angles and ball joint angles. A differential skid plate is included for off road protection. 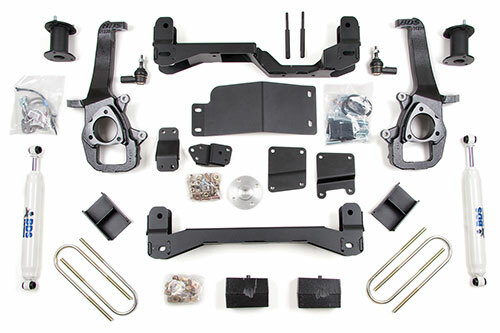 Bump stop drops, anti-sway bar extensions, 3 point differential drop system, front stainless steel brake lines, and strut relocation brackets are also included in this Dodge 4" lift kit. Will not fit Mega Cab models. The rack & pinion steering system is extremely sensitive to an out of round or out of balance tire/wheel combination. The larger the tire and the less the backspacing, the more sensitive the system becomes, causing minor steering wheel shimmy. TRX models reqire the removal of the OE lower skid plate. Not recommended for AWD models.